Kent Hovind & Cindi Lincoln at DAL! – Kent Hovind v. Robert Baty – The Great Debates! 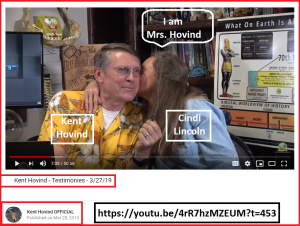 Home→Kent Hovind & Cindi Lincoln at DAL! Peter J. Reilly, Forbes.com contributor, blogger, and Kent Hovind “fanatic”, filed his report on March 24, 2019 regarding his visit to Dinosaur Adventure Land. While I (Peter J. Reilly) was paying homage to the manliest man on the scene William was engaging with Cindy who had wandered over. Cindy is one of those women whose age I cannot judge. Youthful attractiveness combined with some wisdom. Someone who will be able to remain 39 for as long as she likes. They were talking about plants. I did manage to get some back story from her. She was running her own preschool in California. It was explicitly identified as Christian, but when one of the moms started hearing about Jesus from her daughter she complained to Cindy that she was teaching her kids fables. 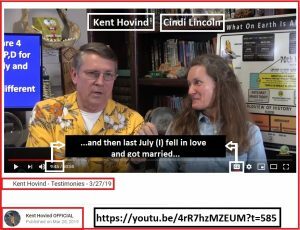 That got Cindy motivated to seek out proof of biblical truth, which led her to Kent Hovind’s videos. She came out for a brief spell as a volunteer and then felt called to come full time. (There was a story to that, but I probably don’t have it straight, as I was not taking notes). Cindy has been a DAL two and a half years. She didn’t say anything to that effect, but when Kent mentioned his wife during the tour, I asked if it was Cindy that was his wife and he confirmed that. Cindi claims she “got married” to Kent, but gives no details as to what she meant by “got married”! We are waiting for details.